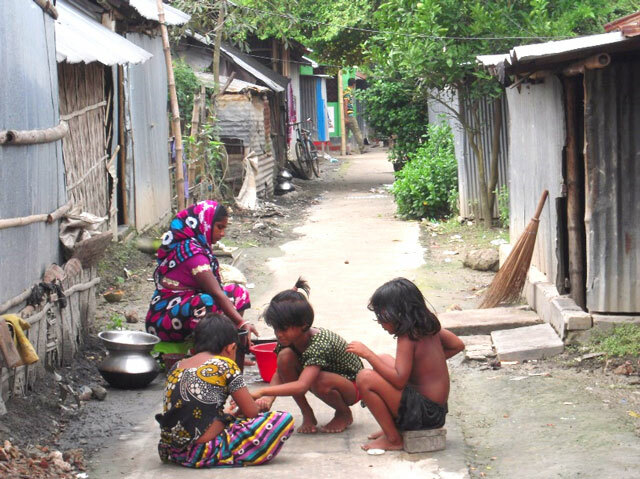 When Rani, a mother of five in Khulna, Bangladesh, found that the tea stall outside her home kept flooding, she didn’t wait for a government climate resilience program to swoop in. Like many people in urban communities facing the effects of climate change, she took action herself – and she had help from friends. After making her plinth more water-resistant and using corrugated iron sheets to extend her roof and protect the area around her home, Rani joined a savings group and became a voice in her community’s efforts to improve the streets for everyone. Highlighted in a new book, “What About the People?,” Rani’s story is one of many that illustrate the crucial role of community networks and cooperative action in improving people’s lives and resilience in cities around the world. Cathy Baldwin of the University of Glasgow and WRI’s Robin King argue that too many urban planners don’t adequately consider the social dimension of building and sustaining communities, if they consider it at all. City policymakers, planners and designers tend to place heavy emphasis on strengthening physical infrastructure. But building up a community’s social cohesion and networks strengthens its social sustainability – its residents’ long-term capacity and motivation to cooperate with each other in caring for the community. Members of a socially sustainable community trust each other, promote their collective interests together, come to collective decisions and take collective action. Such cohesive communities, encouraged through what Baldwin and King call “socially aware planning,” prove more resilient during natural disasters because residents have active networks of neighbors and friends to lean on. When disasters hit, residents use this collective capacity to pool resources, repair physical structures and care for one another. In Cape Town, the township of Khayelitsha has made its streets safer and more livable through the resident-driven Violence Prevention Through Urban Upgrading (VPUU) program. For years, Khayelitsha was dangerous and run-down, with little to no street lighting, poor road infrastructure and frequent crime. In 2006, Cape Town partnered with the township and the German Development Bank to create resident focus groups to identify crime-related problems and community needs. VPUU then held interactive design workshops and brought in professionals to help residents develop pedestrian walkways, street lighting, a neighborhood watch and other features to make their community safer. And it worked. Between 2003 and 2010, the murder rate in Khayelitsha dropped 39 percent, and the overall crime rate decreased as well. Other socially sustainable initiatives started by VPUU include trauma counselling for women and neighborhood-designed public art and amenities, which led to increased employment opportunities and a deeper sense of ownership and community capacity. Portland, Oregon has strengthened its social networks and collective mental well-being by co-creating public squares in three different neighborhoods. Over several months in 2003, the non-profit City Repair Project brought together residents to repurpose deteriorated public squares through community workshops with design and building professionals. These meetings helped residents envision their new public spaces, obtain approval from city officials to implement them and then construct their designs themselves. Together, residents livened up their neighborhood squares with attractive murals, earthen benches, trellises, planters, information kiosks and other interactive installations that they felt would encourage social interaction and positive mental wellbeing. With psychologists’ help, the community leaders for these projects created a before-and-after survey for residents. They found improved mental health, a better sense of community and collective capacity, and stronger social networks. In Jakarta’s Tomang and Manggarai neighborhoods, informal riverside settlements known as kampungs have developed strong social cohesion and collective resilience despite their lack of resources. Community-elected leaders of organizations called Rukun Tetanggas coordinate and lead shared responsibilities for residents at the neighborhood level, while the head of a larger Rukun Warga organization oversees several Rukun Tetanggas, creating multiple tiers of community-based, participatory administration. Some of residents’ shared responsibilities include a weekly communal clean-up of public spaces called kerja bakti and a security rotation called ronda. During floods, like the 2007 deluge that hit Jakarta especially hard, kampung residents rely on community members upstream or at flood gates to provide early warning. The Rukun Tetanggas and Rukun Wargas then organize evacuation, resource pooling and urgent care. In the aftermath, residents work together to clean up and rebuild. The kampungs are an example of how socially aware planning can alter development policy. Efforts to improve housing for informal residents are valuable and important in a world where 1.2 billion city dwellers lack access to an affordable and secure place to sleep. But simply relocating these communities also risks destroying the support systems they have built up. Building socially sustainable, resilient communities takes time, Baldwin and King admit. It means long outreach processes and finding ways to incorporate community feedback. But a neighborhood that has been co-created is much more likely to be cared for by its residents and to sustain itself in the long run. As the world’s cities face the pressures of climate change and rapid growth, planners and policymakers need to design structures, spaces and organizational processes in ways that foster pro-community behaviors and social cohesion. The relationships among residents – what Cheryl Heller calls the “human circulatory system of a city” – are just as critical as infrastructure and services. It’s time to give this social landscape the focus it deserves. Hillary Smith is an intern on the communications team for WRI Ross Center for Sustainable Cities.